High floor cleaning standards where cleanliness and hygiene is paramount. 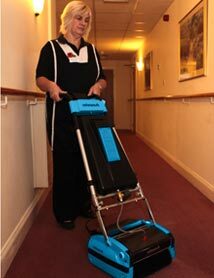 Fast, economical and hygienic floor cleaning for every surface in your retirement home facility. A clean, healthy, and hygienic environment for residents in nursing and residential care homes is of the utmost importance. Offensive odors, spots, spills and stains are removed leaving floors and carpets dry and soil free. Thousands of satisfied Rotowash users depend on the Rotowash for its quality and overall cleaning efficiency. Rotowash is the #1 floor cleaner machine in aged care homes.